This is a simple picture tutorial of how I make one of my favorite soap designs. The sides of the bars are created first using an "In the Pot" Swirl technique and poured into a mold that has acrylic dividers to get evenly sized embed bars. I use sodium lactate (5g per lb of oils) in this formulation because it makes it much easier to remove the acrylic dividers from the soap. This is a 4 day process and I use the same formulation for the side embed logs that I do for the main soap. Day 1 - Create the soap embed logs. I use a 10" long silicone loaf mold that came with acrylic dividers so that I can get evenly sized bars. Day 3 - Unmold the soap and cut into individual bars. You can see how I poured my soap slightly above the height of the side embeds to make sure they were completely covered. Day 4 - Clean up and finish the bars. For these I cut off the excess soap at the top, beveled the long edges and used an acrylic stamp to make an impression on one side of the soap. How you finish the soap is a personal choice and up to you. I just love how these bars turn out. 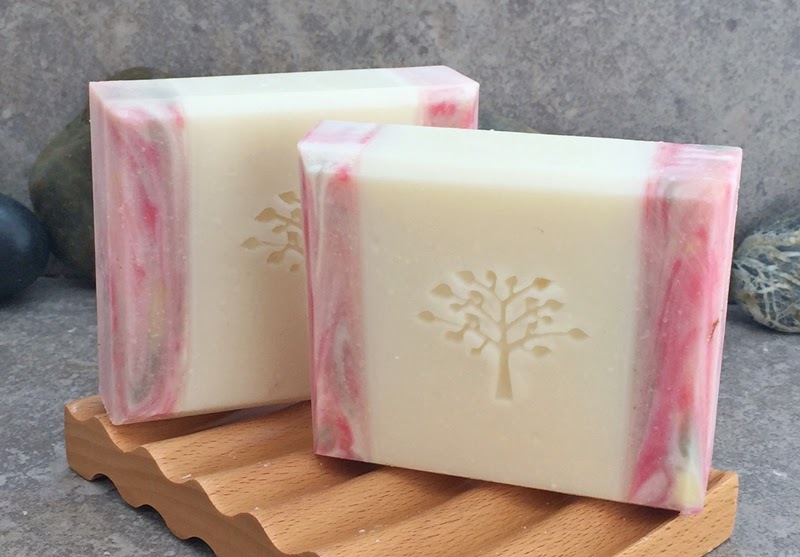 This batch was scented with a combination of Rose, Honeysuckle, Lily of the Valley and Sandalwood. Wow! Fabulous idea!Just discovering you by pure chance. Will be looking at your other pages! I would love to know where I could find a mould like the one you used with the acrylics. Would you mind sharing a link? Thanks for sharing, completely unselfish, I like it very much. where can I get those acrílic dividers, I've been looking for some, would you be so kind of sharing a link?